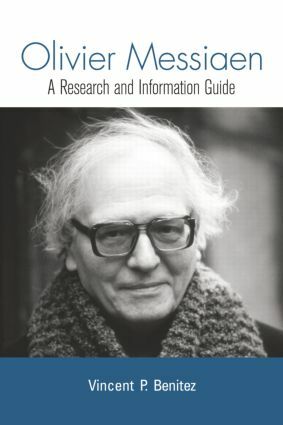 Olivier Messiaen: A Research and Information Guide is a unique bibliographical resource that presents the reader with the most significant and helpful resources on Olivier Messiaen, one of the twentieth century's greatest composers, published between 1930 and 2007. An introductory chapter offers a short biography of Messiaen, a consideration of his musical style and works, and a discussion of Messiaen studies. Chapters 2 and 3 concentrate on the primary literature, organized around manuscript collections, articles and reviews, pedagogical works, lectures and librettos, prefaces, interviews, correspondence, and documentaries and filmed performances. Chapters 4 through 9 focus on the secondary literature, namely, biographical and stylistic studies, topical examinations, discussions of particular works, accounts of Messiaen in works devoted to other topics, reviews of books and significant performances of Messiaen's music, and examinations of source materials on the Internet. A list of works and a selected discography conclude the book.